The beloved festival of lights which brightens up the entire country is none other than the festival of Diwali. It is a Hindu festival celebrated in India in autumn in the northern hemisphere, while it is celebrated in spring on the southern hemisphere.It is one of my favourite festival. The date on which it is celebrated varies according to the Hindi calendar. It is a festival that symbolizes the victory of light over darkness, the triumph of the good over evil in this world. It is usually celebrated over a span of 5 days, while the main day of Diwali occurs on the darkest night of the Hindi lunar solar month that is Kartika. 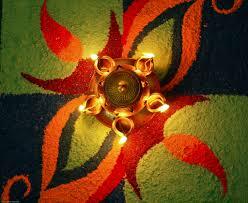 The history and significance of Diwali is different for different cultures and religions. In Hinduism, Diwali marks the celebration that commemorated the return of Lord Rama, his wife Sita, his brother Laxman and Lord Hanuman to the Kingdom of Ayodhya, from the forest after an exile of 14 years. This exile was imposed on Lord Rama by his father, King Dasharatha on the request of Kaikeyi, Rama’s step-mother. Rama had returned after defeating Ravana, the evil monarch of Lanka. Since Rama, who symbolizes light, triumphs over Ravana, who symbolizes darkness, Diwali is celebrated as the festivals of lights. In Sikhism, Diwali marks the day of Bandi Chhor Divas. Bandi Chhor Divas is significant as the day when Guru Har Gobind freed himself and some Hindu Kings, from the prison in the fort of Gwalior. They were in the imprisonment of the Mughal emperor, Jahangir, from where they escaped and arrived at the Golden Temple in Amritsar. Ever since then, Sikhs celebrate Bandi Chhor Divas, by decoration the Golden Temple with attractive lighting, the bursting of fireworks and other festivities. In Jainism, Diwali holds a special significance, since it was the day when Mahavira, the last of the spiritual teachers called Tirthankars, attended Nirvana. So Diwali is celebrated by Jains as a remembrance to Mahavira across Jain temples all over India. Buddhists celebrate Diwali as homage to Goddess Laxmi. This symbolizes their freedom granted to worship any deity, for the betterment of the world. They also celebrate Diwali on a span of 5 days. Diwali is celebrated across India over a period of 5 days. The days include Dhanteras, Naraka Chaturdasi, Laxmi Puja, Balipratipada or Padwa and on the last day, Bhaiya Duji or Bhav beej. Dhanteras, is celebrated in northern and western parts of India and is the first day to start off the five day festival. During and before Dhanteras, people start cleaning their houses and business places. Women and children are involved in the decoration of the entrances with Rangoli which are creative and colourful designs made with colored powder. These Rangolis are made both inside the house and also in the hallways of their houses, buildings and the offices. Another tradition of the festival is decorating the houses and buildings with the lights, colorful lamps and such decorations. This period is also utilized by people to redecorate or renovate their homes. On the night of Dhanteras, diyas, which are small lamps made of clay, are lit and are kept burning throughout the nights. This is done to honor Lakshmi, the Goddess of wealth and Dhanvantari. Narak Chaturdasi is the second day of the festival of Diwali and it is also called as Choti Diwali. According to the Hindu mythology, Narak Chaturdasi marks the day when a demon named Narakasura was killed by Lord Krishna. The day is celebrated by performing early morning religious rituals such as poojas and then celebrations and feasts follow. Interestingly, this day is celebrated as Diwali in the states of Andhra Pradesh, Telangana, Tamil Nadu and Goa. Women often decorate their hands with intricate designs using henna or mehendi. The preparation of sweets, snacks and other food items is also a common tradition of this festival. The food is then distributed to neighbours and loved ones. The third day of Diwali is Laxmi Puja. It is the most important day of the festival. People go shopping for new clothes and dress up in their best outfits on this day as they look forward to joining the celebrations. Diwali or Deepawali is a festival which is celebrated by every Indian, irrespective of their religion. caste or culture. It is a festivity that brings people together and promotes a sense of brotherhood towards one and another. Diwali plays a key role in bringing communities together and resolving past conflicts. It is the festival that symbolizes the victory of good over evil, light over darkness and ultmately, love over hate.